In this quick but helpful article, a software architect documents how to upload images to a web page using Angular and HTTP POST. With Angular, we can call a web service to get an image as a Blob, convert that to an image and display it on a web page. This may sound like a straight and standard use case but I ended up spending a lot of time trying to get this to work and a lot of asking around. This has been one of the main motivations to write this article. To begin with, I am building a website that displays thumbnails retrieved from a URL. On clicking on the thumbnail, the full sized image loads in a new page. Like a typical carousel, but the catch is that the thumbnail is generated dynamically and does not load from or stored on the local machine. Use-case: Image at a URL → Run through a Web service to get thumbnail → Web service responds with a thumbnail of the image → Display the thumbnail on the web page. Make an HTTP POST to get a blob/image — We need to send some input parameters (image URL, keys) to the web service that validates your input and sends the image as a blob (assuming the external service does the thumbnail generation for you). Convert JSON/blob to an image/thumbnail — HTML cannot understand and display blob (weird characters) that the service returns. 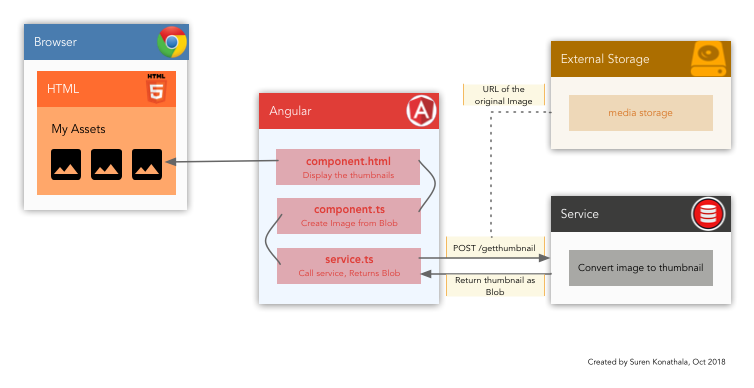 Since the Angular service ablobService returns a blob, we create an image from it using createImageFromBlob . The image/thumbnail will be displayed on the HTML web page. Live example and code on GitHub (coming soon). Discussion on Angular GitHub about this issue. Published at DZone with permission of Suren Konathala . See the original article here.